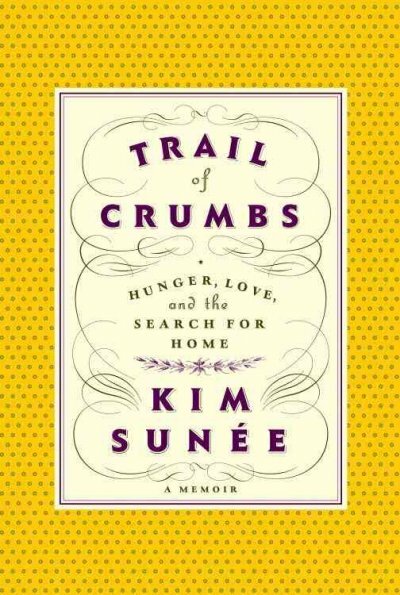 When I heard Kim Sunée speak at the BlogHer Food ’12 Conference, I knew I had to read her memoir Trail of Crumbs: Hunger, Love and the Search for Home. When Kim was appromixately three years old, her birth mother took her to a marketplace in her South Korean hometown and abandoned her on a bench. When the police found her three days later, all that was on her possession was a fistful of crumbs. Without knowing the details of her birth and family origin, Kim is adopted by a young American couple from New Orleans. She and her younger sister, also a Korean adoptee, are the only Asians to grow up in her Louisiana neighborhood. Trail of Crumbs devotes a few chapters to Kim’s childhood and adolescence, but quickly fast-forwards to her early 20s, which becomes the heart of the book. She’s in France as a student, meets a Swedish guy and moves with him to Stockholm, then meets Olivier Baussan (the French businessman who founded the companies L’Occitane and Olivier & Co.) and moves with him to Provence. Throughout the book Kim struggles with issues of identity, discovering who she truly is and what she wants in life and finding a place to call home. While it may appear on the outside that she has it all — a wealthy lover who does everything to try to make her happy, an adorable step-daughter, dozens of friends, delicious meals to eat and social gatherings to attend every night, trips to exotic locations — Kim struggles with depression and hungers for a sense of place. Hunger is a central theme throughout the book, and while the book is laced with culinary descriptions and recipes, this story is truly about one’s search for self. On many levels, I could identify with Kim’s restlessness and wanderlust, never being completely at home anywhere and always looking for the next place to run to. What makes this book a gem is the sheer honesty of Kim’s writing. She discusses some highly personal topics throughout its pages as she deals with an overwhelming sadness, the deaths of loved ones, the inability to buy happiness and trying to find her place in the world. The book is well-written, and I would like to read her second book too, which according to her blog, will be a book of poetry interspersed with recipes. And now I also really want to visit French Guiana too (if you read the book you’ll see why). As the book contains numerous recipes of Cajun, Creole, Korean, Swedish and French-inspired dishes, I naturally wanted to make one of Kim’s recipes to accompany this blog post. I had settled on “Poppy’s Crawfish Bisque” — one of her grandfather’s recipes — and had purchased nearly all of the ingredients when I then couldn’t find crawfish at any grocery store in Las Vegas. So I significantly adapted Kim’s recipe and made “Spicy Cioppino with Creole Stuffing” instead. It turned out pretty tasty and even got an “A” from my husband. 1. 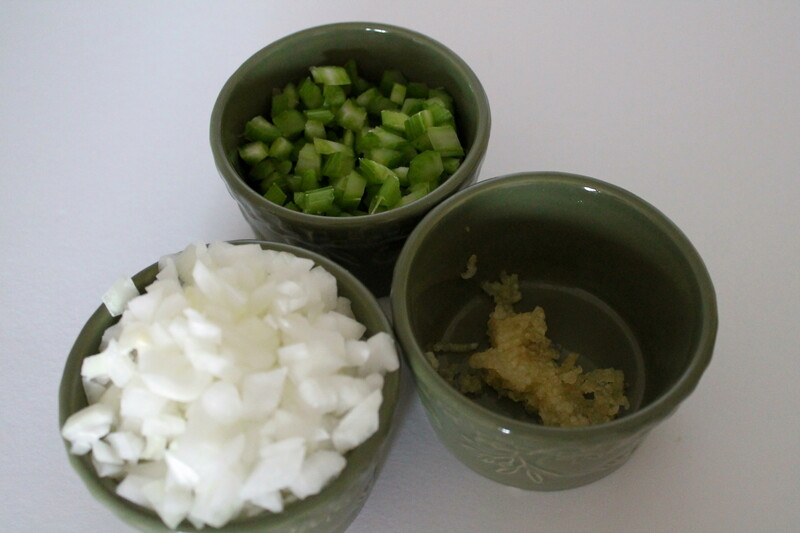 Prep work for the cioppino: Dice the smaller of the 2 onions, 2 ribs of celery and mince 2 cloves of garlic. 2. If your seafood is frozen (which mine was since I live in the desert), place in a colander and run under cool water for about 5 minutes to thaw. As you won’t need to add to to the stew for a while, return to the refrigerator, preferably placing a dinner plate under the colander so you don’t get stinky fish juice all over your fridge. 3. Heat 1 tablespoon of olive oil in a large pot over medium heat. Add the chopped onion and celery and cook for 5 minutes. Add garlic and cook for 1 minute. Stir in tomato sauce, 4 cups of water and wine. Add bay leaves, 1 tablespoon oregano, 1 teaspoon salt, 1 teaspoon black pepper, 1 teaspoon cayenne pepper, 1 teaspoon Creole seasoning and 1/2 teaspoon sugar. 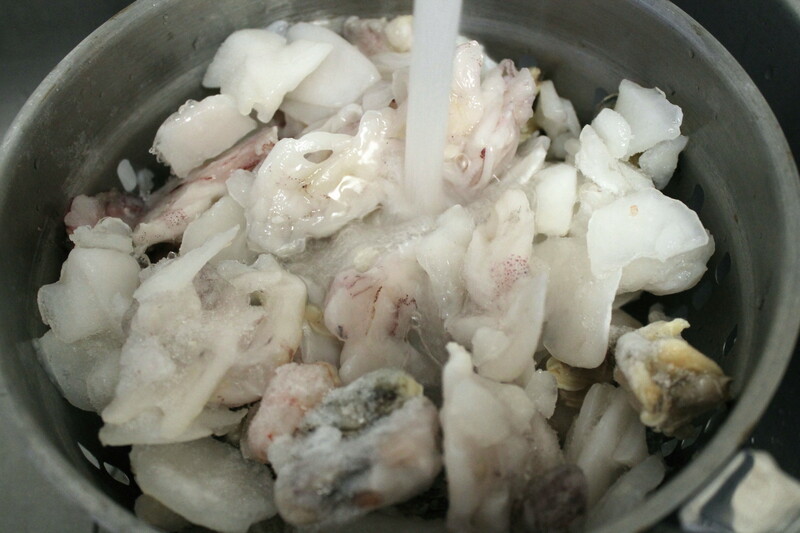 Bring to a low boil, reduce heat and simmer for 30 minutes. Stir occasionally. 4. In the meantime, do the prep work for the stuffing. Cube the bread, being careful not to eat too much of it in the process (I ate about 15% of the bread and still had enough for the stuffing). Cover bread with 1/2 – 1 cup cool water to moisten and set aside. Dice the larger onion, 2 celery ribs, 2 green onions, the parsley and mince 4 cloves of garlic. 5. Add the seafood to the cioppino. Return to a low boil. Reduce heat and simmer for at least another 30 minutes, stirring occasionally, while you prepare the stuffing. 6. Heat 1 tablespoon olive oil and 2 tablespoons butter in a large skillet over medium heat. Add onion, celery and green onions and cook for 7 minutes, stirring occasionally. 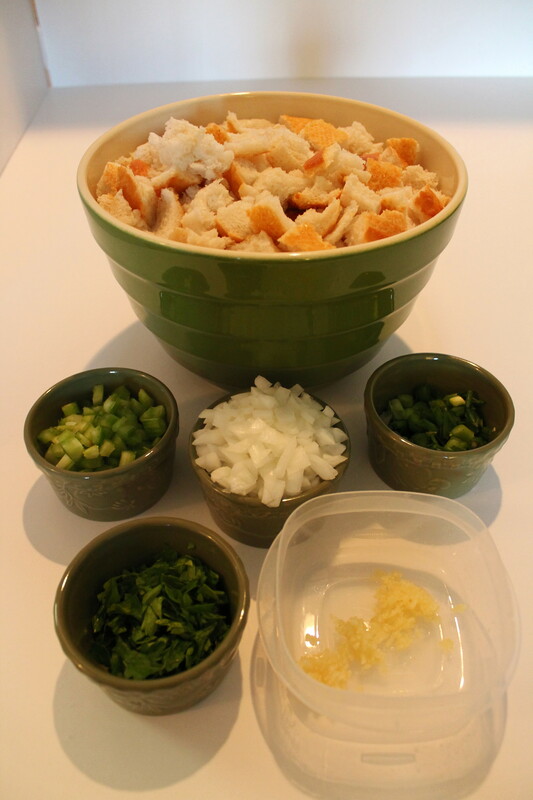 Add bread and stir to coat with onion-celery-green onion mixture. Add parsley, garlic, 1 tablespoon oregano, 1 teaspoon salt, 1 teaspoon black pepper, and 1 teaspoon cayenne pepper. Cook for 10 minutes, stirring frequently. Add up to 1 cup of water, a little at a time, as needed so your stuffing doesn’t dry out. 7. 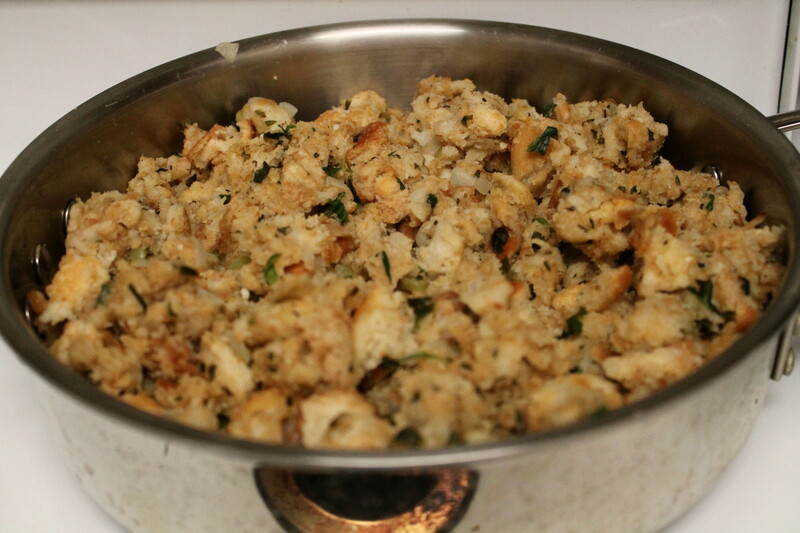 To serve, place about 1 cup of stuffing in a soup bowl. 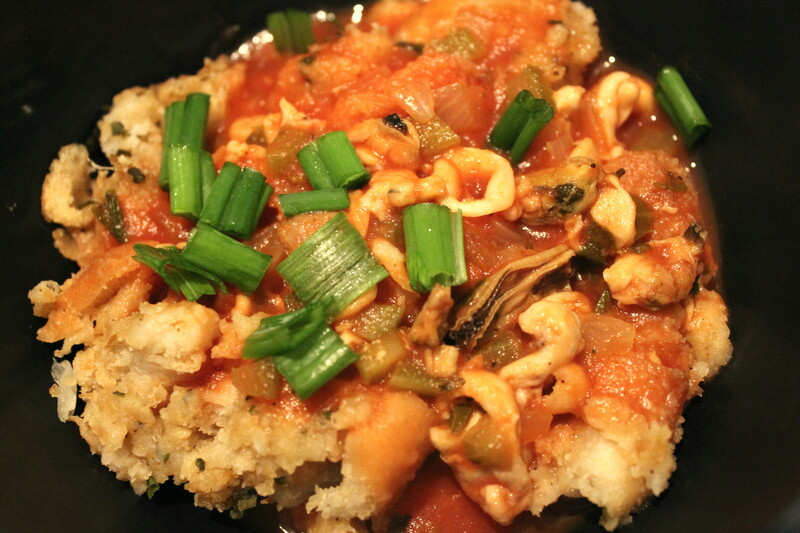 Top with 1 cup of cioppino and garnish with a few chopped green onions. Total prep time for this recipe is about 3 hours. The recipe serves approximately 8 -10 people. I served this with a bottle of French Gerwurtztraminer, which was a bit too sweet for my tastes on its own, but paired well with the spicy cioppino. This entry was posted in Around the World Virtual Book Club, DIY, Movie Reviews/Book Reviews, Recipes and tagged book reviews, cioppino, Creole food, food, memoirs, non-fiction, recipes, Spicy Foods. Bookmark the permalink.